So I have this thing where every trip I take, I institute an official regional (or semi-regional) beverage of the trip. In Malaysia, it was iced coffee Milo, or 100 Plus. In Singapore, it was chrysanthemum tea. In the Philippines, it was Cali Shandy, or San Miguel beer. In France, it was pretty much any cheap red wine we could get our hands on. In North Carolina, it was Cheerwine (which is not wine at all, actually). 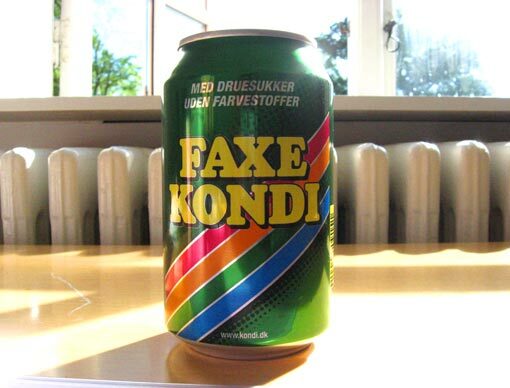 In Denmark, it’s Faxe Kondi. It kind of tastes like a lemon-lime soda, but with druesukker instead of corn syrup. So it’s healthy-ish! Mostly, I’m obsessed with the logo: how can you not love it? For reals! It looks like it hasn’t been changed in the past 20 or 30 years. And that’s a good thing! Plus I love the diagonal stripes. That’s always a hard-sell for me. Faxe Kondi people, please never never change this logo. And send me a T shirt with it, while you’re at it!! Faxe Kondi, I love you. This entry was posted on Tuesday, June 10th, 2008 at 5:27 am	and is filed under -. You can follow any responses to this entry through the RSS 2.0 feed. You can skip to the end and leave a response. Pinging is currently not allowed.